In my novel, I AM JUSTICE, a large, tight-knit family travels the world righting wrongs against women. I thought it was somewhat appropriate therefore, when asked to do a blog post on travel, to share a trip taken with my own big extended, caring family. You can see from the picture--and we’re missing some peeps there--we’re a big group. There’s over 30 of us, when we all get our acts together and show up for the family photo. Not too long ago this big extended family took a South American cruise. One of our stops was in Puerto Limen, Costa Rica. It was beautiful. Because we’re such a big group it makes sense for us not to crowd out the other cruisers, so we hired a private tour to go ziplining, sight-seeing, boating, and visit a banana farm. We had a blast! Our easygoing Costa Rican guides were great and super-friendly. They easily handled our big-family dynamics, even joking around with us and egging us on. Because, let’s face it, when you’re traveling with a large group of competitive people stuff is bound to get weird. Who’ll eat the fried fish eyeball, who can zipline in the most creative position, who spots the most animals on their side of the boat. Did I mention these people are competitive? But that’s part of the fun. No one really cared about who spotted the most monkeys or iguanas on their side of the boat, until one person put up the challenge. After that, everyone began scouring the trees, high-fiving their great finds, laughing, and trash talking. Because seeing monkeys and sloths in the wild is cool, but seeing a monkey or sloth in the wild on your winning side of the boat is freakin’ awesome. The great thing about the tour is that our guides got it. They understood that to us everything we saw was unusual. They might see sloths or mango trees in someone’s backyard a thousand times a day, but they still pointed them out to us. Along with coffee bean shrubs and banana trees. They fed our childish delight--that over-aware sense of a place that comes when you break free of your routine surroundings. That’s one of the great things about traveling, revisiting child-like wonder. Remember how easy it was to SEE everything when you were a child? It was all new, all deserving of your attention and appreciation. In Costa Rica I noticed the red ants, giant precariously hanging beehives, and palm-sized spiders with blue legs, because these things were unusual to me. And a little scary. But I noticed things that weren’t scary too. That's because even though I’ve seen a million KFCs, I’ve never seen a live chicken running around in the parking lot of a KFC. I have now. This summer our big group is traveling to Montana. I can’t wait. I’ve never been there. And, for me, traveling is precious not just because of the time off and the joy of being with my family, but because it takes no effort whatsoever to be in the moment. The moment is alive and thrumming all around me. A big thanks to Eduardo, Cooper, and the entire crew at Lucky Tours in Costa Rica for letting us be silly and competitive and curious, and for helping us play in your part of the world! Giveaway Open To: USA ONLY. 18 and Older. Void where prohibited. No purchase necessary. When not writing, Diana can be found kayaking, doing sprints up her long driveway—harder than it sounds--practicing yoga on her deck, or hiking with the man who’s had her heart since they were teens. Diana is represented by the wonderful Michelle Grajkowski of Three Seas Literary Agency. 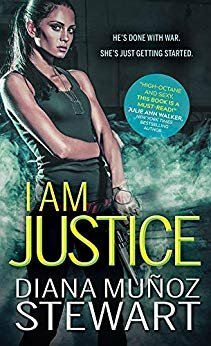 Prize: Print Copy of I Am Justice.